Everything about Italy fascinates me. I have lived in Bella Italia, Beautiful Italy, for about seven months as of 27 July 2017. As of this moment I am in the United States for a visit. And I am missing my home in Italy. One of the strangest of the many things I miss is the Italian language. I miss conversations, television commercials and all the physical expressive behavior that comes naturally to the Italian people. Even for those who do not know a word of Italian, when traveling in Italy, you may enjoy the lyrical, rhythmic sound of it. I know some Italian and am learning more and more each day. When you visit, you may carry an Italian – English phrase book. It is a good idea to know how to say Hello (Buon giorno or Ciao or Salve), How much does is cost? (Quanto costa), where is the bathroom? (Dov’e il bagno?) and other words to help you out of a difficult situation, such as HELP! (AIUTA!). Also remember to say please (per favore) and thank you (grazie). It is expected in most places in Italy that you should be polite. But how will you describe this photo? What if a new friend wants to take you bike riding? A man is riding a bicycle. Un uomo sta guidando una bicicletta. Let’s go bike riding together! Andiamo in bicicletta insieme! Perhaps he wants to meet you in Florence by the carousel or merry-go-round? Meet me by the merry-go-round. Incontrarmi col carosello or con la giostra. La lingua italiana e’ la piu’ bella lingua del mondo! The Italian language as the most beautiful in the world! It is also fun. Some words are just fun to say. We buy a stamp to mail a letter. They buy a francobollo. You will want to know this word for all those postcards (cartoline) you will send home of all the lovely scenery (lo scenario or il paesaggio or la veduta, or la vista). You may even want to send one every day (quotidiano or giornaliero). We walk on the sidewalk. The walk on the marciapiede. And they walk everywhere or dappertutto or ovunque or dovunque. What if you break a latch on your suitcase, your valigia. I think you will need to find a hardware store or un negozio dove vendono la ferramenta. I have been learning a few medical words on my adventure in Italy. If you get sick in Italy you may need to go to the emergency room in the hospital. Dov’e lo ospedale? Where is the hospital. Sono disidratato. I am dehydrated. Ho la febbre. I have a fever. Ho problemi a respirare. I am having trouble breathing. Sto tossendo. I am coughing. Credo di aver rotto il mio piede. I think I broke my foot. Ho bisogno di un radiografia. I need an X-ray. Ha la polmonite. You have pneumonia. Ha bronchite. You have bronchitis. Ha le tosse. You have a cough. Va alla farmacia per riempiere questa prescrizione. Go to the pharmacy to fill this prescription. Note: if you are not feeling well, go to the farmacia. They do dispense quite a few things without a prescription. And if you do need a prescription, they are usually cheaper or close to the price of your co-pay amount if you live in the United States and have insurance. Numbers in Italian are very difficult for me—and very long. Italians do not seem to use numerals to write out a year, a phone number, an address, anything. Arrivo alle vente dicembre duemilla diciassette alle milladicianove.. (They often use military time so it is 1900.) Italian friends, please correct me if I am incorrect. E’ una bella cascata. It is a beautiful waterfall. Soprattutto al tramonto! Especially at Sunset! I love the word soprattutto! Il tramonto al mare e’ sempre bellissimmo! The sunset on the sea is always beautiful! The clouds look like giant birds flying, don’t they? I am here in the US for another few weeks. It is wonderful to see family and friends. I can hardly wait to see my daughter and granddaughter. I will be with them in another city in a couple weeks. I ache to be with them. And yet, I yearn to return to my new home in Italy. Have you visited Italy yet? Let me assist you as you plan your adventure. Italy has quirks as all cultures do. I can help you plan for the differences, and enjoy the places you want to explore. Let me know how I may assist you. 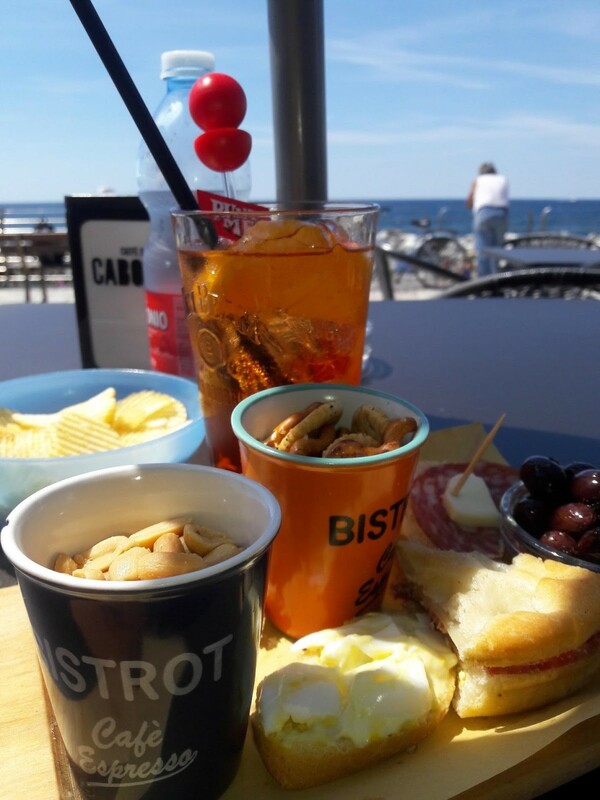 Perhaps we can meet at the sea, al mare, for an Aperol Spritz and aperitivo! Ci vediamo presto, spero di si! See you soon, I hope!